... And we're not the least bit surprised! Westfield is the perfect blend of affordable homes, terrific neighborhoods, outstanding schools and a thriving community that's working to become even better! Westfield joined 49 other small towns in America (population under 50,000) on CNN Money's annual list of Best Places to Live. Last year Carmel, Fishers and Noblesville all made the CNN Money Best Places to Live list under the small city category (population between 50,000 to 300,000). That means Hamilton County is home four Best Places to Live! Somebody's doing something right around here! Our favorite things about Westfield include the Cool Creek Park and Nature Center, Asa Bales Park, the Westfield High School Shamrocks and the new Grand Park Sports Campus. 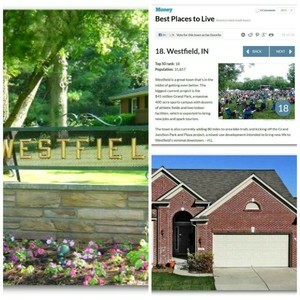 See for yourself why Westfield is one of CNN Money's Best Small Towns - learn more about living in Westfield and see all Westfield homes for sale.